SEARCH with QR codes – WELCOME TO 2013 JS LIBRARY! This year for my orientation to use of the PYP library we are going to use some QR codes. I will have a scavenger hunt for students to orientate themselves but I am also looking for some higher order and creative thinking to be employed. We will look at what a contemporary library is using the Y chart as a stimulus (looks like, sounds like, feels like) and consider how this is different from the library of the past using the PYP ATTITUDES and PYP LEARNER PROFILE as support materials. Teachers and students will have a chance to look at the PYP library using the QR CODE. See the link below for a great example of QR codes being used in a Specialist class (PE). 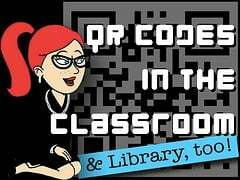 Finally, this glogster is an excellent introduction to QR codes in education.